Brookside Fire Service not only design and install Dry & Wet Risers throughout the UK, we can also provide a thorough maintenance service in accordance with BS EN 9990:2015. Dry Risers (fire mains) are an important piece of equipment for tall buildings. When it comes to keeping your property safe from the risk of extensive fire damage. Buildings above 18m will tend to have dry risers (fire mains) and buildings over 60m will have wet risers. Due to the nature of them, dry risers (fire mains) can be prone to serious neglect and even vandalism so it is important to have them regularly maintained and inspected. With the potential for severe penalties should they fail to function when needed, the dry risers (fire mains) should be visually inspected and serviced every 6 months and, pressure tested annually. Brookside Fire Service can provide the complete fire safety solution for your business. Whether this is for Dry & Wet risers or for other aspects of fire protection. Contact us now to discuss how we can help your business. External “Fire Brigade Inlet” or “Dry Riser Inlet”, these should be red painted and near a road on an external wall. In some areas where vandalism is a problem, the normal glass front can be replaced with steel. 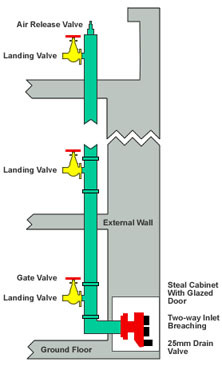 Internal – valves on landings “Dry Riser Outlet” these valves will be a gate type. External no obvious signs except the building will usually be very tall, 18 plus floors etc. Internal – valves on landings “Wet Riser Outlet” these valves will be globe type.